We held another successful Schools Pallet Garden Challenge in 2014. Due to the kind generosity of the sponsor FFS, Contin, prize vouchers were again awarded to each school taking part. The 2013 Pallet Challenge was as good as in previous years. The creativity of the children in chosing a theme for their garden and their enthusiasm in deciding what to plant and working hard during the summer term to ensure their pallets were perfect for the judging day was impressive, as was the support from their teachers, parents and grandparents. The Scottish Gardeners' Forum again generously awarded the Club £50 to give each school prize money for future projects. Cawdor Primary chose a very topical theme "The Year of Natural Scotland", portraying the Highland scenery with a mountain and on it a path, a cairn, a pine forest and wild flowers. Millbank chose "The Sixties Children's Television" with Bill and Ben and their flowerpots and, of course, Little Weed. Auldearn's youngest children interpreted the nursery rhyme "Mary, Mary, Quite Contrary" with silver bells and little maids all in a row. Rosebank children offered a "Serenity Garden" based on Buddhism with a Buddha, altar, pond with tadpoles instead of the usual fish, and an Oak tree for everlasting life. Finally Croy Primary produced a more conventional but very colourful "Rock Garden". Challenge Trophy winners: Cawdor Primary School and runners-up: Millbank Primary School. 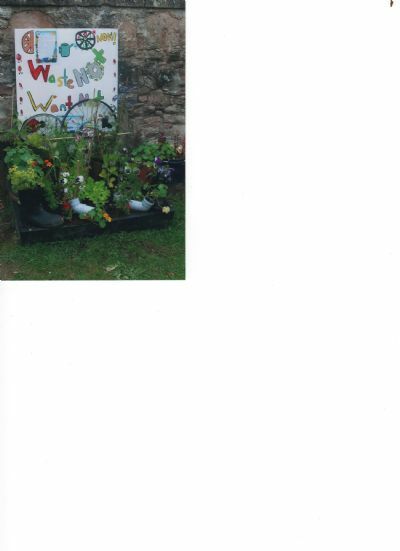 We continued with the Schools Pallet Garden Challege this year following the previous years' great success. We are delighted to announce that we have received a grant of £100 from Scottish Gardeners Forum (SGF) for this year's competition. This grant will be used to fund additional prizes for each participating school. Four schools took part and as usual the children used their imaginations to create four very different pallets. Croy Primary School made a seaside garden, Millbank and Auldearn Primary Schools decided to celebrate the Queen's Jubilee and the winners, Cawdor, chose the London 2012 Olympics as their theme. After the Club's participation in the Pallet Garden Challenge at Gardening Scotland organised by the SGF, in April 2010 we challenged all the local Primary schools to plant up a metre-square pallet garden to illustrate a theme of their own choosing. The frames for these gardens were donated by the Club to the schools courtesy of Awards for All Scotland lottery funding. Tulloch Timber (Nairn) Ltd generously offered to sponsor the competition and a Shield was donated for the winning school. Five schools took up the challenge that first year. The children created wonderfully colourful pallet gardens, each reflecting an particular aspect of their school. The winners, Millbank Primary School, chose to use their pallet to celebrate their Centenary year, complete with a tiered cake. In 2011 five schools again participated. The children came up with very different but imaginative pallet gardens. Croy's was an edible plot, Cawdor's was a coastal garden, Ardesier decided to go exotic with a mini Jurassic Park, newcomer, Auldearn, depicted their area and the winners once again, Millbank, pictured below, used their pallet to illustrate ideas for re-cycling. Our congratulations go to all the children who worked so hard to create these pallets.